Behold the Scots Pine (Pinus sylvestris). Growing across Europe, it can be found in the Mountains in Southern Europe, and in lower regions as you go further north. Distinctive in its own right, forests can be found of this majestic blue-green needle bearing tree across the continent. 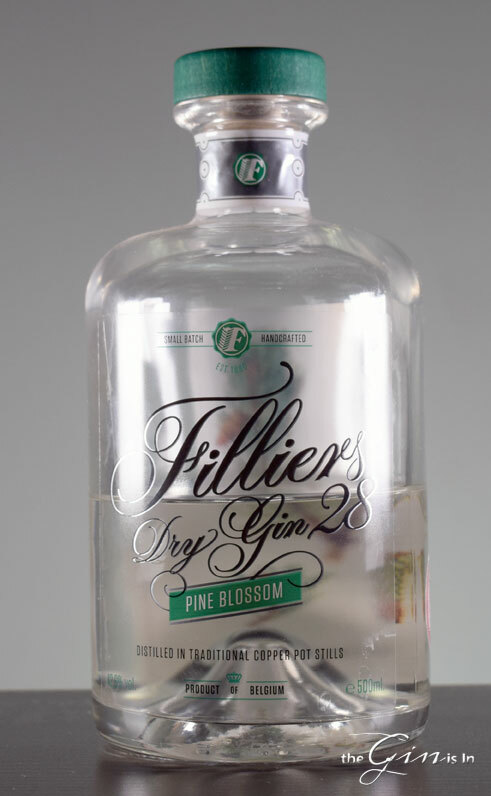 The folks at Filliers Distillery in Belgium, best known for their Genevers, have taken their Dry Gin 28 and added the buds of the Scots Pine to create an absolutely splendid gin that earns the badge “piney.” Filliers Pine Blossom Dry Gin is a gin that lives up to its name. The nose is (as you might have guessed we would say) piney. Pine-accented juniper, coriander, pine branches (think Christmas, perhaps the remnants after the tree has been trimmed), and even a hint of citrus zest. It’s absolutely magical (in my opinion), but it’s not as literal as you might be thinking. Pine adds to the juniper, it doesn’t replace it. Juniper is still the star here. The palate is coniferous, certainly. Coriander and violet appear briefly, dancing at the fore. Mid-palate. creamy and rich, juniper, pine bough, and vanilla bean. The finish is medium long, with a warm character. Resiny juniper and a dash of menthol on the close. This is stunning stuff, and I couldn’t get enough of it, just on its own. Neat, Filliers Pine Blossom Dry Gin is truly a pleasure. Though I was perfectly content to sip this entire bottle neat, I did gather the courage to try Filliers Pine Blossom Dry Gin in a cocktail. The Gin and Tonic (w/ Jack Rudy’s Tonic Syrup, we’re definitely on a Gin & Tonic Syrup kick around here) was pine buds in the background, ginger, and lemon zest. Plenty of juniper as well. The Tom Collins began with oodles of fresh lemon juice, but the gin comes through in the background lending it a warm coloration, which was most prominent on the finish. Overall, Filliers Pine Blossom delivered, though it may have come across a bit more everyday gin, with the pine blossom notes subsumed by the juniper. And how about that Martini? Pine needles on the nose, chamomile, juniper, whits of herbal bouquets. It begins complex and concludes with juniper. Fans of classic gin will love how the Pine accentuates many different sides of the juniper in each taste. It’s not exceptionally pine-dominated either. It’s built on an already exquisite gin, and executed perfectly. I’d also recommend Filliers Pine Blossom Dry Gin to fans of contemporary gin, because I think it pulls off the rare feat of managing to be classic while pushing the envelope. It’s smooth, well balanced, and as great neat as it is mixed. My only caveat might be that you’d probably best like pine. If that doesn’t sound like your bag, stick to the Filliers Dry Gin 28. However, Pine Blossom earns our highest recommendation. ** Have I mentioned you can pre-order my book? !